IBM® System Storage™ N series with Operations Manager software offers comprehensive monitoring and management for N series enterprise storage and content delivery environments. Operations Manager is designed to provide alerts, reports, and configuration tools from a central control point, helping you keep your storage and content delivery infrastructure in-line with business requirements for high availability and low total cost of ownership. We focus especially on Protection Manager, which is designed as an intuitive backup and replication management software for IBM System Storage N series unified storage disk-based data protection environments. The application is designed to support data protection and help increase productivity with automated setup and policy-based management. 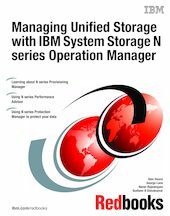 This IBM Redbooks® publication demonstrates how Operation Manager manages IBM System Storage N series storage from a single view and remotely from anywhere. Operations Manager can monitor and configure all distributed N series storage systems, N series gateways, and data management services to increase the availability and accessibility of their stored and cached data. Operations Manager can monitor the availability and capacity utilization of all its file systems regardless of where they are physically located. It can also analyze the performance utilization of its storage and content delivery network. It is available on Windows® , Linux® , and Solaris™ .